Handwriting - Capital Area Speech & O.T. Occupational Therapists frequently receive referrals to work on handwriting. But why does handwriting matter? Simply put, it’s been an important method of communication for thousands of years, and continues to be important for everyday life. In school, at work, when completing application forms, and planning our days, people often pick up their pens. However, in these times of increasingly advanced technology some people wonder if handwriting is becoming obsolete. In some ways perhaps, but there are many reasons that it shouldn’t. For one thing, the simple act of writing helps with brain development. Increased brain activity occurs whenever we use this complex skill in a way that does not happen when we type. 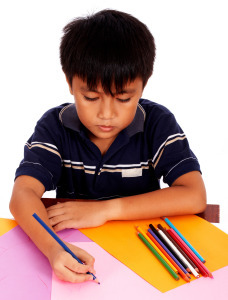 This is because writing involves fine motor skills, spatial skills, eye-hand coordination, memory, and planning. As a child, the development of neural connections through writing is incredibly important. Secondly, studies have shown that when we write things down (think classroom notes, grocery lists, and to-do lists) we are more likely to remember them. Additionally, for purposes of safety, writing can also be important. If for some reason, we become unable to communicate verbally (in incidences of injury, for example) writing can become a primary form of communication. What does it mean to have “good” handwriting? Generally speaking, it means that the writing is legible, and there are several pieces to the puzzle when it comes to legibility, including motor skills, visual skills, and the combination of the two. Let’s take a look at this through different age groups. What does “good” handwriting look like at different ages? Kids are playing fine motor games and doing simple eye-hand coordination tasks like drawing pictures, learning to color within the lines of a shape, trace simple lines and shapes, learning to use scissors. By age 5 or 6 they are using one hand predominantly, with the other hand as a helper. In kindergarten they are learning how to write letters and draw more challenging shapes. A fisted or otherwise awkward grasp on crayons or markers, from age 3 and up. Difficulty copying simple shapes (lines and circles) or starting to draw features of people and common objects. To get little hands ready to hold a pencil (down the line), have them pick things up with tweezers, bread tongs, or clothespins; play with finger puppets; fingerpaint with a different color on each finger; play crawling games to help develop the muscles in their hands; and color with small pieces of crayon or chalk (like one-inch long). To get them ready for more precise eye-hand coordination, have them put stickers onto designated spots as part of arts and crafts activities, do simple mazes, string beads with holes of different sizes, and play with constructional toys. To help establish hand dominance, never force them, but have them play with games that involve using both hands together, such as toy nuts and bolts, wind up toys, and grinder or crank toys (like some play-dough toys). Writing becomes an increasingly important skill, and by the upper grades the majority of the child’s work is likely to be handwritten. Kids complete worksheets, journals, answer questions about reading assignments, and later on write paragraphs on notebook paper. Difficulty with letter formation, letter size, spacing between letters and words, and letters that float or sink below the baseline. Messy but fast writing; or neat but slow writing. Perceptual tasks such as puzzles, spot-the-differences, and hidden pictures. Precision tasks such as mazes, dot to dots, mirror image drawings, and grid drawings. Adaptations to the type of paper/lines your child is using; adaptations to the pencil/writing tool. Your kids are taking notes in class, and often have worksheets to complete as well as longer written assignments. All of the same signs as in the elementary age group. Teachers and other people having difficulty understanding what the child has written. Talk to an occupational therapist about adaptations that can be made to the tasks, setting, or materials used if writing is posing a significant challenge. Depending on the child’s strengths and needs, it may be helpful to revisit cursive as an alternative to printing. Children should start becoming more proficient with typing at this stage. If you have concerns about your child’s writing, talk to his or her teachers about school strategies, and consider an occupational therapy screening to find out more information about what can be done to help. Mueller, P. A. & Oppenheimer D. M. (2014). The pen is mightier than the keyboard: Advantages of longhand over laptop note taking. Psychological Science, 25(6), 1159-1168.